In mammals, a dosage compensation mechanism exists to equalize gene expression levels between male and female. This process is initiated by Xist RNA, a long noncoding RNA that mediates the transcriptional silencing of a complete chromosome. 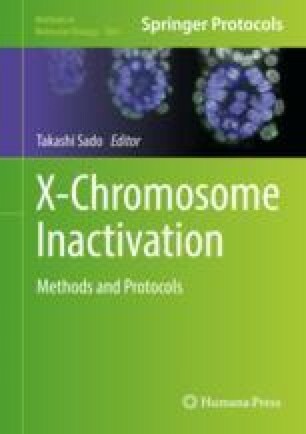 The kinetics of events occurring on the future inactive X-chromosome has been described in detail over the last 20 years. More recently, parallel studies using advanced biochemical assays and genetic screens identified key factors critical for the silencing cascade. Here, we describe the procedure adopted in one of these studies, an shRNA-based loss-of-function screen in mouse embryonic stem cells (mESCs). The screen made use of a reporter cell line in which Xist-mediated silencing could be monitored by changes in GFP fluorescence. Loss of function was achieved using a custom made bar-coded pooled shRNA library. The screen aimed to identify shRNAs that lessen Xist mediated repression of the GFP reporter. The methods that were applied are of potential relevance for the development of related screens, for example to better understand how specific repressors silence one or several genes.